The Lake Forest Golf & Practice Center provides a real opportunity to work on all aspects of your game. It provides nice Lake Forest golf deals for the area. 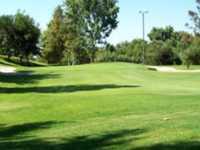 The course has been carved out of what use to be Southern California orange groves within the city limits of Lake Forest, a beautiful residential environment. After warming up, you can fine-tune your game on this nine hole, par 29 course that measures 1,115 yards on rye grass. The course was designed by Michael Orren and opened i in 1991. The course has a 25 rating with a slope of 113. Most "Pitch N Putt" courses don't have many hazards, but the Lake Forest Golf & Practice Center is an exception. There are several sand traps and lakes on two key holes. The course is well maintained. There are not many options for Lake Forest tee times, but you will not be disappointed at the cost for these Lake Forest Golf & Practice Center tee times, which you can reserved online. The practice facility has a two tiered driving range, chipping green with 5 bunkers and a 9-hole putting green. Other amenities include a small pro shop, club rentals and a snack shop. The players love the opportunity to use the practice facility and then go play a quick nine to use what the learned.